Movin’ On Up takes pride in recognizing outstanding Express Employment Professionals associates who’ve been acknowledged by one of our Express offices. Every associate we put to work has a story to tell, and we want to celebrate the accomplishments of the individuals who come to work for us. This month’s associate spotlight recognizes an associate who is always up for an assignment—Frantz Cameau from the Braintree, MA Express office. Frantz was hired in October 2014 and has since then completed more than 20 short- and long-term assignments for the Braintree office. He was recently named the Associate of the Year for this location. “He is our go-to associate because he is reliable, hardworking, and just a pleasure to work with,” said Maggie May Moran, the office’s Senior Staffing Consultant. 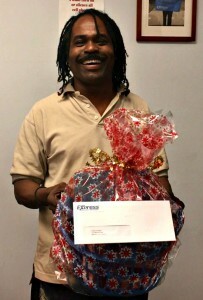 “Frantz always has a smile on his face, is consistently grateful, and always happy to help whenever he can. He has referred many people who he not only helped find work, but also helps get to and from work, as he regularly provides transportation to assignments for his friends and family. Express is proud to have Frantz as an associate, and we appreciate his dedication to going above and beyond! If you’re an Express associate or know an associate who would be a great candidate for our associate spotlight, let your Express office know. And, if you work with an Express associate you’d like to feature on Movin’ On Up, let us know in the comments section below.